AWS True Unblended Calculation - The code logic behind Mobingi Ripple and Wave. This post summarizes the programming logic behind our products Ripple and Wave on how we analyze and calculate AWS usages and cost. In order to get insight and collect data of an AWS account usages, the best way is to enable AWS Cost & Usage Report (CUR) and a trunk of big data in CSV format will be dumped into an S3 bucket under the payer AWS account. These data contains all of the usage details and service dimensions, such as AmazonEC2 Running Hours, Instance Type, Reserved Instance (RI) record, CPU utilization, Storage I/O, etc. In 2018, we published Mobingi Ripple and Wave, two product offerings that calculate and analyze AWS cost. These two services use the same code logic to calculate accounts usages & cost including properly applying RI to instances, re-allocating RI across linked accounts (under same AWS organization), handling spot instances or on-demand instances, calculating data transfer and DynamoDb, as well as all products which AWS offers. In order to get insight and collect data of an AWS account usages, the best way is to enable AWS Cost & Usage Report (CUR) and a trunk of big data in CSV format will be dumped into an S3 bucket under the payer AWS account. These data contain all of the usage details and service dimensions, such as AmazonEC2 Running Hours, Instance Type, Reserved Instance (RI) record, CPU utilization, Storage I/O, etc. A MSP or an enterprise company needs to issue invoices to its customers or group companies. The payer account A has 3 linked accounts B, C, and D.
Account B owns some EC2 RI but didn't consume all. Account C and D don't own any RI but consumed the RI left by account A, and in a result received lower cost than they supposed to. B: Invoice of usages with RI applied. C: Invoice of usages without any RI. D: Invoice of usages without any RI. In the above case, the invoices received from AWS will not work. Whether we use the unblended cost or blended cost_, the total is always lower than they suppose to be charged. It comes to the situation of re-calculating EC2 costs by ourselves. In our company, we call it True Unblended cost calculation. lineItem/UsageStartDate <- The start date of daily calculation, eg: "2018-08-01T00:00:00Z"
bill/BillingEntity <- who is the seller, eg: "AWS", "AWSMarketplace"
lineItem/LineItemType <- eg: "Usage", "RIFee", "Credit", "Refund", "Fee", "Tax". 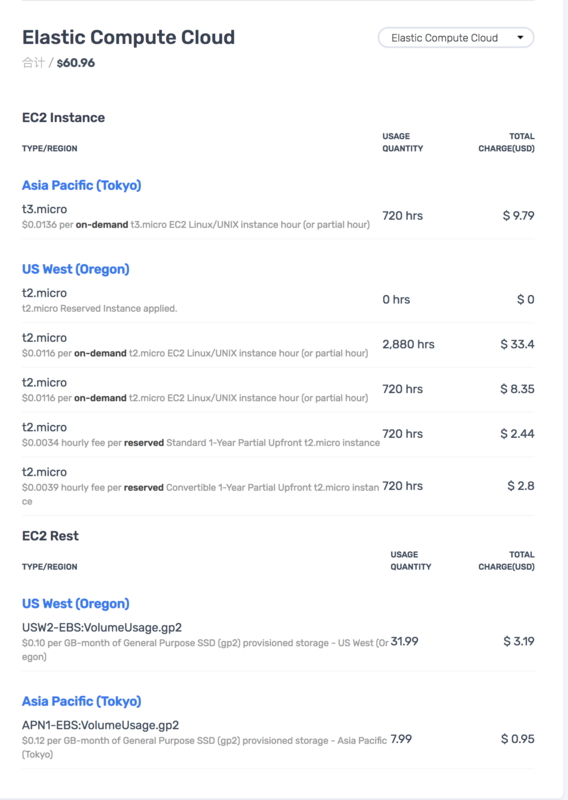 product/instanceType <- eg: "t2.micro", "db.m4.large"
* Note: with a dedicated host, you purchase an entire physical host from AWS and that host is billed to you on an hourly basis just like EC2 instances are billed. "ItemDescription": "$0.0034 hourly fee per reserved Standard 1-Year Partial Upfront t2.micro instance"
"ItemDescription": "$0.0039 hourly fee per reserved Convertible 1-Year Partial Upfront t2.micro instance"
Of course there are many factors which may cause the re-calculation on EC2, RDS, ElastiCache etc, such as “NormalizationFactor”, “Multi/Single-AZ Deployment”, “Free-Tier”, but the whole idea is like what I described in this post. It’s simple to understand but also complex to achieve. It certainly requires a long reading on AWS documentation and over time analysis on CUR CSV. Furthermore, the big data era is booming and if we can intelligently dig the valuable data and summarize in a human-readable structure there will be much more valuable information for every AWS customers to better understand, manage and forecast the budget. For any comments, questions, or feedback, please reach out to us @MobingiTech. Copyright © Mobingi 2018. All Rights Reserved. This site uses the brilliant Type-on-Strap as theme. Powered by Jekyll and netlify.com.